I am writing to advise you of the death of my father Harry Singer on the 12th October 2005 at the age of 84. He was at the school before WWII and studied classics. He also represented HCS at rugby and rowing. After leaving school he was articled as a Chartered Accountant to his father in Bridgend, South Wales. At the outbreak of war he joined the Army and served as an officer in the Royal Artillery. Among other campaigns, he landed in Normandy two days after the invasion commenced in 1944. Harry returned to civilian life after his demob in 1945 to resume his studies in accountancy. As soon as he qualified, HBS re-joined his father in partnership and continued in general practice until his retirement. In 1981 he was accorded the honour of being elected President of the Institute of Chartered Accountants in England and Wales. I met two of his contemporaries following his passing and they both recalled how, a full back he had a powerful kick, scoring goals even from the half way line. This was in the days when a heavy leather ball containing a “bladder” would be used ! 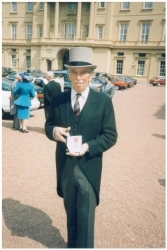 Harry was awarded the OBE in 1995 for services to the charity, SSAFA, who care for ex servicemen and women. He was their National Treasurer. His brother Geoffrey, also an Old Herefordian during the war years (OH 40-46) had sadly pre-deceased him in 2000. He was medical GP in Yately, Hampshire for many years and saw it grow from a small village to a huge commuter town.